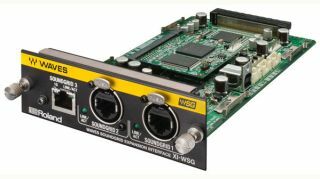 The What: Roland’s Professional AV Division is now shipping the XI-WSG Waves SoundGrid Expansion Card, offering even more system possibilities for the M-5000 Series consoles, based on the OHRCA platform. The Roland M-5000 and M-5000C Live Mixing Consoles are based on the OHRCA platform, which opens a new generation of live sound solutions for audio professionals. “OHRCA” stands for “Open, High-Resolution, Configurable Architecture,” and the M-5000 Series reflects this by delivering freely definable audio paths, supporting multiple audio format protocols, and offering 96kHz sound quality throughout the system. The Roland M-5000 Series’ internal mix architecture is not fixed and can be freely defined for mixing channels, AUXs, Matrices, subgroup buses, and MIX-MINUS buses within a range of up to 128 audio paths, allowing users to create a console structure to suit the needs of the application. The consoles can support up to 300 inputs and 296 outputs, all at 96kHz and even more at 48kHz and allow for integration of multiple multi-channel audio protocols including Dante, REAC, and MADI. The Bottom Line: Taking full advantage of Waves’ SoundGrid networking technology, the XI-WSG has three ports for connection to Waves SoundGrid Servers, allowing for low-latency, redundant audio connection and direct connection to a PC for MultiRack SoundGrid control without the need for an external network hub. The XI-WSG accommodates 64 inputs and 64 outputs for integrating Waves’ high-precision plug-in processing, multitrack recording, and playback with an M-5000 Series Console.